The Archival Methods Metal Edge Quantity Print Organizer Kit (QPO) for 4 x 6" Prints will help you get your "act" together when it comes to putting all your precious images together. How many times have you opened a drawer on your desk and found a stray print buried under tax papers, unfinished letters or bills? With this system, you won't have that issue anymore. This kit contains everything you need to organize years of images. Includes: Archival Methods exclusive Print Caddies, Dividers and Poly Bags - all geared towards preserving your memories. What better way to store 2400 photos? Organize them by subject, date or topic. And, when completely finished, the entire package stores neatly in a closet, drawer or bookshelf. This 100-pack of 4.5 x 6.25" Polyethylene Bags from Archival Methods is made to store and protect prints from the effects of handling and outside contaminants such as dust and moisture. The bag is made of uncoated chemically inert polyethylene, and strength and clarity are balanced with the polyethylene bags. The Archival Methods 12.5 x 15 x 4.25" Short Top Box is often called an "Archival Shoe Box". 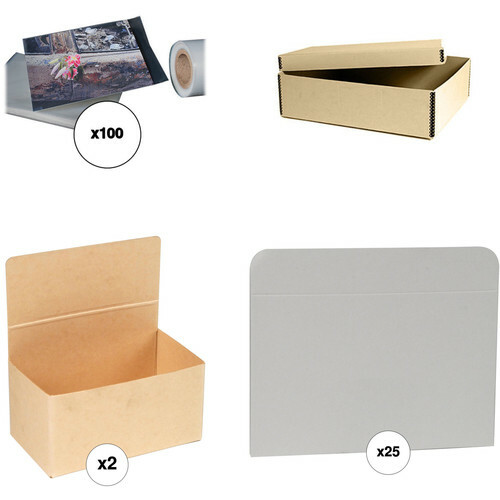 This style box is a general purpose container for safely storing and protecting post cards and photographic prints. They are also commonly used for storage of small specimens such as mineral samples. Baseball cards? Old photos? Newspaper clippings? How many old-style shoe boxes do you have in your basement, attic or closet? Archival Methods now offers a way to use the same size boxes but ones which are archivally safe. With Archival Methods, your precious memories will remain intact for years to come. Metal edge clamps are corrosion treated in black polyester coating with wax-free polyester on the blind side; these clamps provide rigidity and high stacking strength. Organize your photos in these Archival Methods Print Caddies, a component of the Archival Methods QPO 1202 Kit. Consisting of four boxes, each has the capacity of 300 prints with a fold-over top flap that can be labeled for added organization. These print caddies are sold here as a spare or replacement item. Great way to organize prints. When used as part of the Shoe Box Storage System, provides an archival way for long-term storage of small photos. These Archival Methods all-purpose Index Cards are a useful addition to many of their metal edge boxes for separating and cataloging prints or other contents. Cards are die-cut from 10-point archival card stock (about the thickness of a business card). Also useful as placeholders when contends are removed from storage. The cards are scored at one side and the bottom to be easily trimmed for use in smaller-size boxes, as indicated. Box Dimensions (LxWxH) 9.0 x 5.0 x 0.2"
Box Dimensions (LxWxH) 15.2 x 12.9 x 4.3"
Box Dimensions (LxWxH) 9.5 x 9.25 x 0.75"
Box Dimensions (LxWxH) 6.0 x 5.0 x 0.25"